It’s asparagus season, so lets celebrate with this tasty dish! In this simple preparation (based on what I had on hand) you’ll stack blanched asparagus and mushrooms duxelles (minced and sauteed with shallots and parsley) on chicken cutlets, topping them off with creamy Havarti cheese and a bit of smoky bacon (pancetta would be my first choice, but I didn’t have any on hand). There is also an easy pan sauce, but if you don’t overcook the chicken, it’s not really needed. Enjoy! Pancetta is my first choice, but bacon works nicely in a pinch. Have your butcher split and pound chicken breasts into cutlets. Preheat oven to 350°. Prepare duxelles. Blanch asparagus. Preheat a large frying pan over medium high heat, add a swirl of olive oil and bacon – cooking bacon until half done, remove and reserve. Meanwhile, season cutlets with salt, pepper and paprika and then dust in flour. Transfer to pan and sauté until barely half done (1 minute per side – depends on conditions and breast thickness). Place par-cooked cutlets on a large parchment lined sheet pan. 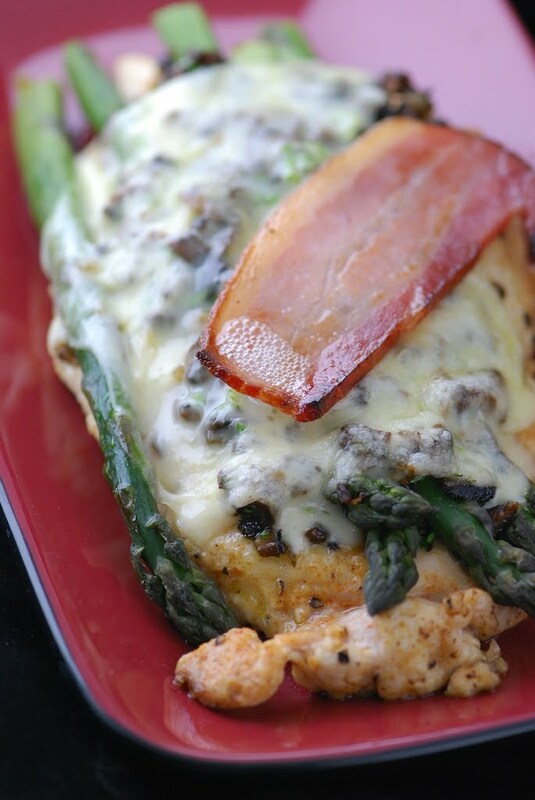 Lay the blanched asparagus evenly over the chicken, top each with an equal share of duxelles and a slice of cheese. Top with a slice of bacon (or pancetta) and place in preheated oven, cooking to 140-150 degrees internal – about 8 minutes. Sauté the mushrooms and shallot in butter until the mushrooms have released their moisture and begin to brown. Season with the parsley, salt and pepper. Right from the oven – parchment paper makes cleanup a snap! Once established, asparagus comes back every year and when conditions are right, it grows so quickly, a spear from each clump can be harvested every day. This photo comes from the Villano Brother’s farm in Fort Lupton – but sadly they pulled up their asparagus for other crops.